The 35" Light Dome for Light Storm LS Cob120t 120d, 300d, and 300t from Aputure is a unique, 16-sided, 24" deep light shaper that is intended for the LS Cob120, 300d, and 300t fixtures, but thanks to the included Bowens speedring, it is compatible with the many manufacturers making products that use that mount. The extensive surface and depth of this hexadecagon, backed with its depth and reflective interior give high output and a focused look. The output is significantly softened by the removable double diffusion front face and the internal diffuser. All of these production strategies combine to produce a flattering, wrap-around quality of light with natural-look catchlights in the subject's eyes. Box Dimensions (LxWxH) 32.3 x 9.0 x 3.3"
Light Dome for Light Storm LS Cob120t 120d, 300d, and 300t (35") is rated 4.6 out of 5 by 18. Rated 5 out of 5 by caleb from Tons of Soft Light I've been using the Light Dome for about a month so far and really dig it. Great way to get TONS of soft light. Just keep in mind this thing is massive, so if you have a small studio, you might run into issues. I shoot videos for youtube and I've found it difficult to get the light close to myself due to the size and the dome getting in the shot. That aside, I love being able to move one c-stand and everything moves together whereas my previous setup required moving the light and diffusion separately. Rated 5 out of 5 by Chulanga Bandar from A good quality product with a beautiful light profile I purchased Aputure Light Dome to be used with my Godox AD600B for portrait photography (although it's made for continuous lights) and used it only once so far.? ?You have to put some effort into assembling it. Roughly took about 10-15 minutes for assembling. One major issue in my copy is that it was little difficult for me to mount on the AD600 Bowens mount. I couldn't put it into the locked position easily.? It's better if you have a dedicated studio to keep it assembled and mounted on your light. It's quite large.? Being said that, I love this product. It provides a?beautiful light profile and I think the product is ready for heavy duty. Rated 4 out of 5 by Anonymous from Good, but hard to disassemble Great product. The light is soft and even - exactly what you want. But, once its assembled, it is hard to take the rods out. It seems to be meant for a permanent setup. I thought it could be used for on location shooting - more of a studio piece of gear. Rated 5 out of 5 by hgthedp from Great single source key or eyelight Used along side a 1200 booklight as a fill/eyelight and loved the look for more upkey corporate stuff. Also great as a moody keylight. can pull second diffusion for a harsher look. Rated 5 out of 5 by Spiro from Light Dome for Light Storm An excellent accessory for an excellent light! Rated 5 out of 5 by Anonymous from There is Safety Aputure Aputure puts out quality products for the lowest price possible. This dome is no exception. This has great build quality and professional grade soft light at a price you are not going to beat. That's all you need to know. Get it. Rated 5 out of 5 by Charles from An extraordinary value for perfect COB 120D soft light The box easily compares to softboxes 3-6 times more expensive; the double diffusion spreads the focused COB 120d beam beautifully, as you'd expect from a Chimera or Broncolor class softbox...plenty deep. It's a big box, so make sure you have the clearance and room, but man, the light for portraits is spectacular. If you have the COB 120t or COB 120d, run, don't walk to buy this thing. Rated 4 out of 5 by Emmanuel from Great value. Really beautiful soft light out of this. Its big. Only downfall is setup time, it brought back some PTSD to the days of fighting speed rings on interview days. Will this work well with Godox AD600 Pro (w/ godox S-Type bracket)? What about regarding it's weight and power rate? Asked by: Don Ryan S.
The Godox AD600Pro Witstro All-In-One Outdoor Flash has a built-in Bowens S-mount allowing you to connect light modifiers using the Bowens S-mount directly to the monolight fixture. 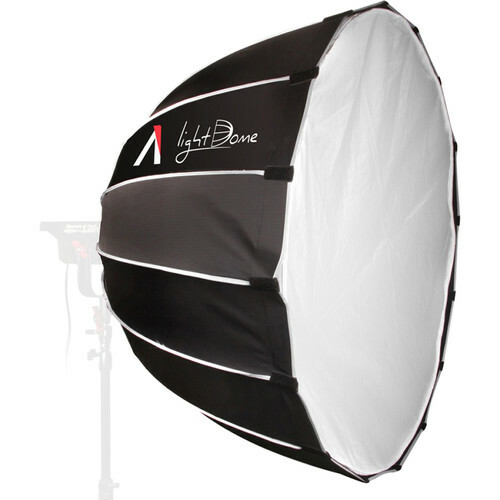 The Aputure Light Dome (35 ) has a built-in Bowens S-mount on the octadome softbox. The Godox S-Type Speedlite Bracket for Bowens is designed for hot shoe speedlight flash usage, and is not required to connect the Aputure Light Dome (35 ) to the Godox AD600Pro Witstro All-In-One Outdoor Flash; the softbox connects directly to the AD600 flash head. The softbox weighs approximately 4 lbs and would remove approximately 1 to 1.5 stops of light from the light fixture. can this work with profoto b1 with a special adapter? I contacted Aputure with your inquiry. They state that the current Aputure Light Dome includes a removable Bowens S-mount speedring. However, the soon-to-be-released Aputure Lightdome Mark II parabolic softbox will have a FIXED speedring that is NOT removable. As such, if you want to purchase a removable speedring, you would have to purchase the currently avaialble (original) Aputure Lightdome.If you are looking for a 16-hole speedring option that is compatible for use with Profoto light fixtures, I would recommend either the Elinchrom Litemotiv Octa Bracket for Profoto, B&amp;H # ELLMBP, or the Phottix Speedring for Profoto Flash Heads, B&amp;H # PH82595, for your usage needs.If you want a similar parabolic softbox recommendation from a third-party manufacturer designed for use on Profoto light fixtures, , I would recommend the FotodioX EZ-Pro Deep Parabolic Softbox (28 , Profoto Speed Ring), B&amp;amp;H # FOEZPDSPRF28, which comes with a dedicated speedring designed for use on Profoto monolight strobes like the Profoto B1 500 AirTTL 500Ws Battery-Powered Monolight. How much does the Light Dome weigh? While I have not yet received a reply from Aputure on the weight of the Aputure Light Dome for Light Storm LS Cob120 (35 ), our listed shipping weight for the item is 4.5 lbs. As such, I would state the weight of the unit is slightly less than 4.5 lbs. Will this work with 120d mark ii?? Yes, this softbox works with the Aputure C120d Mark II. Unfortunately, the manufacturer has only provided the weight of this product in its original packaging, which is 4.5 lbs. Does this softbox work with Interfit S1 500Ws HSS TTL Battery-Powered Monolight? Is there a special ring adapter needed? This softbox includes a Bowens S type ring which can fit the Interfit S1. What's the best Aputure light for this modifier? Any light with a bowens mount should work. That is what makes the aputure light storm lights so nice, any bowens mount accessories will work with them. Can you use this softbox for the 300D? Yes. The speed ring is the same, standard size for both lights.